PETALING JAYA, 29 March, 2017 – Ford Motor Company, together with its local partner Sime Darby Auto Connexion (SDAC), today named Montfort Boys Town in Selangor as the latest recipient of its Ford Conservation and Environmental Grants Programme in Malaysia. 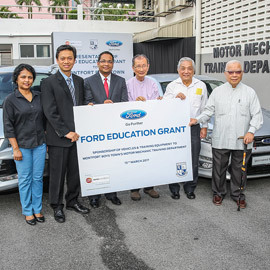 Ford together with Sime Darby Auto Connexion (SDAC), sourced two vehicles – a Ford Kuga and Ford Mondeo – and purchased training equipment for use by the students to gain practical knowledge and skills and assisting them towards becoming successful automotive technicians. Montfort Boys Town provides practical vocational training to underprivileged youths to help them acquire the right skills to enter the workforce and live a successful life. The school currently offers Sijil Kemahiran Malaysia (SKM), Automotive After Sales and Service training, level one (SKM 1) and two (SKM 2). The donated Ford vehicles and equipment will allow Montfort Boys Town to introduce a SKM 3 programme. “Ford is proud to support the Montfort Boys Town and help further build on the learning opportunities and practical training and experience they can provide to their students,” said Bagus Susanto, managing director, Asia Pacific Emerging Markets, Ford Motor Company. “Ford Conservation and Environmental Grants Programme is part of our continued investment in the social and economic development of our country. We hope our contribution will help the students gain the necessary skills and knowledge to enter the workforce and propel their future careers,” added Syed Ahmad Muzri Syed Faiz, managing director, Sime Darby Auto Connexion. In addition to the Ford Conservation and Environmental Grants Programme that was launched in 2000, the company has demonstrated its commitment to support local communities in Malaysia through various CSR efforts, including the annual Global Caring Month. As part of the Global Caring Month in 2016, volunteers from Ford and SDAC visited the Lovely Nursing Centre in Petaling Jaya, where they spent time with the elderly, repainted the facility and donated necessary supplies. Ford’s ongoing commitment to Malaysia also includes projects and initiatives related to automotive education and road safety. One of such programmes is Driving Skills for Life (DSFL) that aims to increase road safety awareness. In the past three years, DSFL has offered free-of-charge, hands-on driver training to members of the public, Ford customers, university students and, this year, expanded to corporate partners. Since launching the global grants programme in 1983, Ford has awarded more than US$5 million in grants to hundreds of environmental and educational projects in 60 countries, spanning Asia Pacific, the Middle East, the Caribbean and Central America. “Ford’s legacy of caring goes back to the company’s founding and Grants are awarded for community projects around the world to build a better world around our three strategic priorities of community life, education and driver safety,” explained Bagus Susanto. In the Asia Pacific alone, Ford has played a pivotal role in advancing environmental initiatives and the Conservation and Environmental Grants programme has become a regular project in markets ranging from Hong Kong, Cambodia, Laos, Myanmar and Sri Lanka to Guam and Fiji. Ford Motor Company is dedicated to preserving the environment for future generations and equipping local communities with necessary skills and knowledge to improve their lives. Initiatives such as Ford’s Conservation and Environmental Grants programme is evidence of commitment to encourage, support and reward the actions of individuals, groups and non-profit organisations in achieving the same goal.